Kochi is one of the upcoming city and a popular travel destination in South India, due to the presence of a good number of travel destinations and tourist spots. The Jewish Synagogue in Kochi which has become a unique signature in the tourism map of India is another major attraction in Kochi city. The Synagogue was established in 1568 AD and is one of the major travel attraction in Kochi. The Synagogue is situated in Mattancherry in Kochi and is one of the oldest buildings in this place. A large number of Jews had arrive in Kochi for business purposes centuries ago and the then Kochi King donated a piece of land for constructing the present Synagogue. 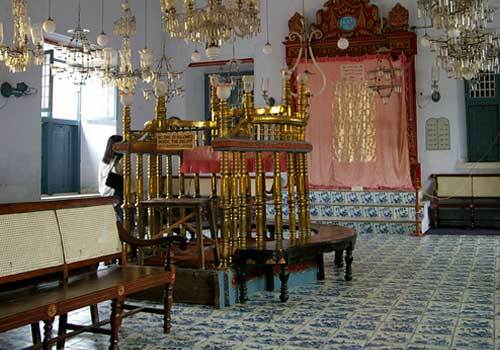 The Jewish Synagogue is Kochi is considered as the most important of its kind in India. The Jewish Synagogue in Kochi was partially damaged during the Portugese attack in 1662 but was repaired later. The Synagogue has become a major hot travel tour spot in Kochi and people from different parts of the world arrive Kochi to visit this ancient Synagogue. The hanging lamp, the tiles with amazing art works etc bring a sense of enthusiasm among the visitors. All the tiles seem to look same, but the fact is that they are having different art works on each of them. Another major attraction of the Synagogue is the 45 feet high clock tower which was built in 1760. The time on the clock is denoted in Hebrew, Latin, Malayalam and Arabic language. The Synagogue is open to visitors from Sunday to Thursday and remains close on Fridays and Saturdays as it is traditional holidays for Jews. The time allotted for visiting the Synagogue in Kochi is from 10 Am to 1 PM and from 3 PM to 5 PM. For those who would like to have a glimpse of the ancient Jewish tradition in Kerala should visit this place once they reach Kochi. Either be it a business trip, family vacation trip, honeymoon travel or any casual trip with your friends, Kochi Jewish Synagogue is a perfect place to visit. 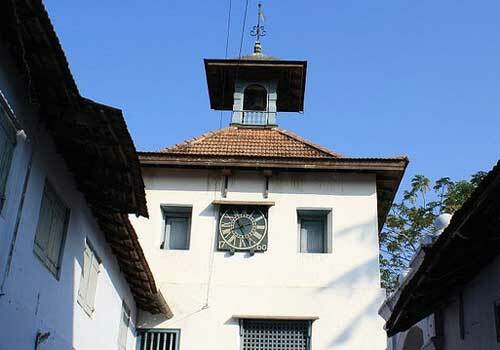 The Synagogue in Kochi is celebrating its 444 years of glory this year and a lot of tourists as well as jews from nearby places and cities are expected to arrive here. This will surely be going to witness a huge flow of visitors to this ancient Synagogue in Kochi. Even during normal days, we can see a large number of tourists from across the world visiting this place and exploring its amazing architecture and history. Kochi is well connected to the other major cities by air, rail and road and once you reach Kochi you can either hire a taxi, auto, and public bus services or even ferry services which will help you in reaching Mattancherry, where the Synagogue is located. Kochi is also blessed with a good number of budget as well as luxury hotels and lodges which will help you to find a better accommodation with all the modern facilities and amenities. You can take the help of a reputed travel agent or tour operator which will help you in visiting this ancient Jewish Synagogue in Kochi. This entry was posted in Kochi and tagged jewish synagogue india, jewish synagogue kerala, jewish synagogue kochi, kochi travel destinations. Bookmark the permalink.